And we were joined early on by our moderator, Kirin Robinson. 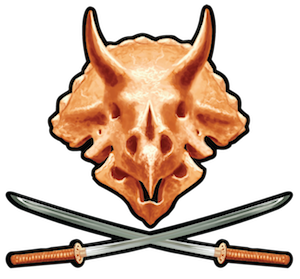 The discussion was wide-ranging, going from fairy tales to modern blockbusters, from screenwriting to pulp heroes, with plenty of notes and references as we went along. Thanks so much to my fellow panelists and the audience who joined in with plenty of interesting questions and comments as we went along. I know nothing about marketing comic books. Nobody has ever heard of me or my comic book. The best thing about being in a situation like this is that no matter what I do, I’m probably going to make things better. So here’s what I did. Like I said, I know nothing about marketing comic books. But I do know that everyone appreciates something valuable, something fun and entertaining. Just printing up an ad or a flyer and trying to get people excited about that seemed to run counter to that idea, though. Whatever we did, we wanted it to be something that people would actually appreciate getting. Something they might take home, read a couple of times and share with their friends. So we didn’t know anything about marketing comic books, but that seemed like a winner of an idea. Anime North is clearly our target market, but we were super-tight on two resources: money and time. Every second Dave (the artist) spends doing a “special Anime North thing” is another second our backers don’t get their books, and we’ve taken up plenty of time already. But we do have some great material already on the website and otherwise kicking around — the stories I’ve written about the girls, and of course the eight-page prologue we did last year while raising our funding. The latter seemed like it could hold some real potential. “New Girl” has been available online for just about a year now, but only people who have been to the site will have seen it. What if we did a print run of that? Sure, anyone can read it online, but a nice print version is always welcome, and it made for a cute little self-contained comic book. We didn’t put any real advertising in it. 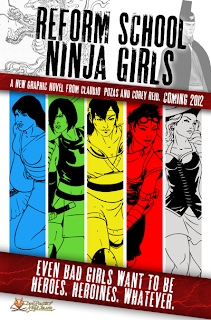 Anyone keen to learn more, we figured, could find REFORM SCHOOL NINJA GIRLS easily enough. A free comic book for anyone who wanted it, no strings attached, seemed like a solid offering. But how to get it into people’s hands? We didn’t know anybody at the show. But I’ve got friends. So I asked everyone I knew if THEY knew anyone who would be working at a table at the show. And it turned out, a few did. One of my co-workers was even working a table at the show himself. Man, I’ll tell you, learning to ask my friends for help has been one of the most life-changing lessons ever. So we got ourselves passes to Anime North and schlepped in a few hundred copies of New Girl, and they got handed out with every purchase at a couple of big tables there. Right into the waiting hands of the very people we’re hoping will buy this book. Without any knowledge of marketing, with a minimal budget and just by exploring our network, we were able to get about two hundred copies handed out over the course of the weekend, which means (if each one got passed to at least one other person) we reached around 400 people — people who maybe had never heard of REFORM SCHOOL NINJA GIRLS before, but who we know are interested in non-mainstream, Japan-themed comics. Not bad for a couple of guys who don’t know anything about marketing comic books. We’ve still got more than a hundred copies of this little mini-comic — if you think you could do some good for the cause with them, let me know and I’ll send you a bunch! REFORM SCHOOL NINJA GIRLS, the comic book I’m writing, started life as a set of conversations with my old friend, Claudio Pozas, who’s a fantastic fantasy artist. Claudio and I tossed ideas back and forth and came up with a set of final character designs we loved. They were strong, bold and easily distinguished one from the other. But in the end, Claudio didn’t want to do a comic book. So, character designs in hand, I needed to find an artist to take on the project. That meant finding some candidate artists, and then choosing the best of the bunch. I had no idea how to do either. The first problem was relatively easy to solve. I know that if I tell everyone I know what I’m trying to do, SOMEBODY will have better ideas than me. So that’s what I did; I told everyone I knew that I was looking for an artist. And sure enough, a couple of folks referred people THEY knew to me, and so I was building a list of candidates. They all had sites where I could look at their work (if you’re an artist and you don’t have some sort of online portfolio, well, good luck with that), and it was easy to set up quick coffee-shop meetings with them, just to make sure they weren’t obviously crazy people that I was going to hate. They weren’t. So now I had to solve my second problem: how to choose among the bunch. The artists’ portfolios weren’t going to be sufficient for me to make a decision. It’s impossible to tell from pre-existing art if an artist can deliver images to my own specifications, my own scripts, and I have no way of knowing how long it took them to do the work, if it was delivered on time or six months after the due date. So I wanted to audition them, but I knew from working with Claudio and other artist friends that a professional artist doesn’t exactly have a lot of free time. I wanted to be respectful of that time. I decided to pay for an audition. At that first meeting, I pitched each candidate my audition idea: I would give them two pages of script and they would deliver inked pages, at a date of their choosing, and I’d pay them $100. $100 seemed like a sufficient sum for that level of work. I wanted the artist to know how much time they could spend on the audition pieces. And it was worth it to me to pay a few hundred dollars if I ended up with a great artist who could meet a timeline. So the process was in place. Next I had to decide how I was going to judge the entries. Pole-vaulting is, well, about as hard as it looks. I chose the two pages for the audition carefully. One was the “pole-vault” scene from the online prologue — a very tricky bit of physical business. The other was a dialogue scene from a later issue — where a couple of characters get into a tense debate about what to do right before the big finale. It needed comic timing, the ability to handle a bunch of characters in a room, and a quick transition to a new locale. They were both challenging pages (in very different ways), and I expected artists to struggle with them. I also made it clear that I wanted them to follow the existing character designs, and I expected them to keep my up-to-date on their progress. could they draw what was in the script, and keep to the guidelines? if they couldn’t, would they reach out and ask for my help? could they meet their own timelines and keep me posted on their progress? Having those simple questions to answer made me feel like I could judge the candidates with some sort of confidence. And I got fantastic stuff back. Not everyone got their stuff in on time, however, and that was a good lesson to learn early on. Not everyone was able to exactly picture what I’d asked for in the script — some people asked for help in solving what were admittedly tough illustration challenges. Some folks didn’t ask for help, and then didn’t do what was asked, so that was interesting to learn, too. 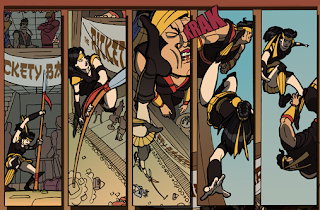 And in the end the choice was clear: Dave Knox, who’s now the artist for REFORM SCHOOL NINJA GIRLS. His style was very different from what I’d originally pictured, but we had so much fun talking about the book, and he hit his timelines, talked with me all through the process, and followed the guidelines perfectly. He also watched dozens of pole-vaulting videos so he could nail the five-panel sequence of Masayo’s awesome triumph over Shima. You can see the final version of that in the online prologue: New Girl. So in the end, despite not knowing really anything about art or artists, I was able to come up with a reasonable process for finding a good artist, just using basic networking and some simple criteria up front. It was actually kind of fun! And sure, it cost a few hundred dollars, but given that I intend to sell this comic book to make money, I ought to believe that it’s worth investing a little money in it up front.